If there is one sure thing about concrete basement walls, it is the fact that they will crack. This is one thing most homeowners have to contend with. According to the American Society of Concrete Contractors (ASCC), over 70% of new homes develop cracks due to different reasons. As a homeowner, it is important to learn more about these cracks as part of proactive home maintenance. Cracked basement walls have become a major subject of debate especially on online forums. There are contractors who advise homeowners to ignore such cracks while others recommend DIY solutions using sealants. While such advice might work, it is important to appreciate the importance of an on-site inspection by a qualified foundation contractor. Every basement wall has its own unique design and there are different materials used for construction. As such, it is risky to rely on generalized advice that might not work for your house. To avoid making the wrong decision when it comes to basement cracking, it is imperative to get more insight on this problem. 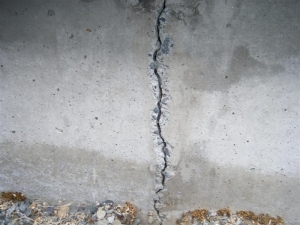 Vertical/ diagonal cracks: These occur due to concrete shrinking as it cures. Horizontal cracks: Are caused by pressure against the walls either due to soil saturation or lateral water pressure. Stair stepping wall cracks: Are caused by foundation settling and soil pressure. Stress points: Your home’s walls might be suffering from pressure caused when sewer lines and other utility lines are drilled through. House settling: It is expected that every structure will settle with time. This is because a lot of excavation will be done when laying the foundation. This causes foundation wall cracks and bulging. Tree roots: If trees and shrubs around the foundation are not cleared, their roots will cause a lot of pressure on basement walls eventually leading to cracks. Water pressure: Lateral water pressure is one of the major causes of wall cracks. In low lying areas, the problem is even worse because of surface water that has no escape route. Any gaps on the foundation walls will eventually allow more water to seep through and cracks will form thus compromising the integrity of the entire structure. Soil movement: Clay soils are among the riskiest to build on but they are also very common. These soils expand and contract rapidly and this causes pressure on the basement walls. Eventually, this movement leads to minor cracks that develop over time. If you notice cracked basement walls, call a foundation contractor who will test the type of crack and determine the underlying cause before carrying out repairs.